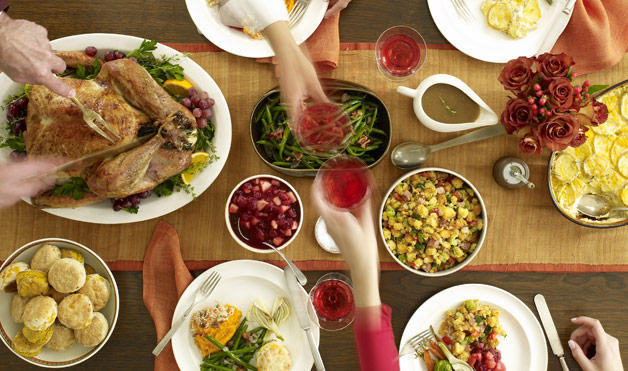 Thanksgiving Survival Guide for Disordered Eaters. Thanksgiving is undoubtedly the most stressful holiday for anyone dealing with disordered eating. For some, it is downright panic inducing. After all, despite its origins, it has become a day that is all about food. Whether we struggle with under-eating or over-eating, this poses it’s share of challenges. I’ve struggled with both, at different times, and it wasn’t until last year that I finally learned to deal with the pressures of Thanksgiving in a healthy way. I had an eating disorder for 13 years—and it was actually on Thanksgiving Day of 2002 that I made myself throw up for the first time. I had tried before unsuccessfully, but that night—after eating what I thought was far too much of several “forbidden” foods—I tried again. That time, it worked. Once I knew I could do it, I went down a painful spiral, and eventually I was throwing up every day. This is a common tale, and I know millions of people in the U.S. are still dealing with these issues. If you are one of those people, or if you love one of those people, take heart—there is hope. There is help available. Make your day about giving thanks. Forget about the food for a second—if you could design a day that was all about gratitude, what would you do? Good news is, that’s exactly what we have the opportunity to do, and there’s no “right way” to do it. We could make a list of the things in our life we are most thankful for. Perhaps write thank you notes to every person who makes our life better just by being in it. Go to a place that’s sacred for you, and give thanks to your higher power—or to the universe itself, for the blessings you have. Even if you’re not feeling particularly thankful about your life at the moment, these practices will not only draw your attention away from food, but they will also fuel your healing. Give back. One of the best ways to get out of our heads and get some perspective is to give back. It could be something as simple as doing something nice for a friend or family member—or if you have more time, you could sign up to volunteer. Homeless shelters, animal shelters, food banks and many other non-profit organizations need help on holidays, and they are often short-staffed. Feed the homeless, play with some dogs that are cooped up in a shelter, visit a children’s hospital—the options are endless. Not only with you be helping them, but you’ll be helping yourself as well. Crank up the self-care. This is not a good time for us to be exhausted, dehydrated or overwhelmed. If you have a lot of family in town, take some alone-time breaks—even just going and sitting in the bathroom for a few minutes to get away can be helpful when it’s chaotic. Get a good night’s sleep. Drink plenty of water. Go for a walk or do some yoga. The better you take care of yourself, the less likely you will be to succumb to your destructive habits. Talk to your family and friends about your concerns. When the time comes to sit down at the table for your meal, some obsessive thoughts will likely come up for us. They could be thoughts about calories, or they might be concerns about what people will think of our eating habits. Regardless of what they are, letting the people we love know what we’re dealing with is essential. Some of us are lucky enough to have friends and family who really get what we’re going through, and know exactly how to provide the best support, but most of us have to train them how to help us. Let them know what to look out for and how to communicate concerns lovingly with you. Ask for their support. Trying to manage this on our own is likely going to result in disappointment. If you don’t feel comfortable talking to your family, or the people you’re spending Thanksgiving with, talk to someone else. While it’s helpful to have our “support people” with us, it isn’t necessary. Bottom line is—the more honest we are about our challenges, the more likely we are to put our demons to rest. One Profound Strategy to Overcome an Eating Disorder. Iris McAlpin is an eating disorder recovery coach, mental health advocate and writer—on a mission to make the world a happier, healthier place. You can connect with her on Instagram, Facebook and Twitter for daily insights into depression recovery, eating disorder recovery and creating fulfillment under any circumstances.